Different and delicious slow cooker recipes! made this with elk, fabulous. in my crazy cuisinart fastcooker it took only 4 hours on low. Not much flavor considering the great ingredients. Won't make this again. great base for anything from pulled pork to carnitas. This sauce was a tad too tangy for my liking. I think next time I will leave out the lemon juice. I needed up up the sugar to make this balance. I've burned this twice even though I followed directions and watched the granola closely. Could just be my cooker, but in the future I'll try shortening the time the granola is on "high" and maybe adding the wheat germ and other quick-toasting ingredients later. The instructions are pretty specific about high heat timing--and that's accurate. We burned/threw out our first batch. We followed the instructions to the letter for batch #2 and the end result was ok, not great. I prefer crunchy granola & this was a bit chewy. Also, you've still got to stir the pot every hour--so I think I'll keep to my oven recipe where I stir every 20 minutes, it's done in 60, and got a nice crunch at the end. We added almonds. This is one of my staple soup recipes. Always good in the winter months, a "feel better" food. I make a batch plain and it freezes well, reheats well. Great in a thermos for lunch. This is a good soup for a cold winter's day. Note though, it may take substantially longer than 8-10 hours for the magic to happen. Did not taste the same to me as steamed artichokes, much more like boiled artichokes. Good way to cook root veggies when you don't want to turn on the oven. While you don't get the caramelized goodness that happens with oven-roasting, the veggies are gently steamed/roasted and it's a convenient way to get more veggies in your weekday meals without fuss, to have with dinner, cold as leftovers in a salad or pre-cooked to add into other dishes. Very good and easy. This time I omitted the pepper and just used yellow squash, zucchini, green beans, basil, garlic and red onion for the veggies and herbs. Leftovers good cold with leftover farro or kamut, and ceci beans for a salad. This is so good and easy. Served over polenta, rice, or on its own with cornbread on the side. Even better using romano green beans, which hold up to the slow cooking really well. This is in regular rotation for me! For my cooker at least, the cook time here is way too long, and I wish I had checked it at the four-hour mark. This turned into mush with a very stiff, porridge-like consistency that was not helped by the amount of starch the rice gave off. Very unappetizing. I am not sure why I thought these would be different, but no, they are not better than plain old canned refried beans. Certainly not worth the precious bacon fat I added! Delicious! I really love this recipe. I have made it in both the slow cooker and converted it to my pressure cooker. It is a bit soupy as written for the slow cooker so I cut the amount of water in half. For the pressure cooker (Instant Pot), soak beans overnight then put all the ingredients in the pot with 3 cups of water, use the Manual button and cook at high pressure for 35-40 minutes. Reduce the sauce using the saute button if desired. This is my go to "baked beans" recipe. You can't really taste the maple, but it does add a complexity to the finished dish. The cayenne also gives these beans a tasty kick. The only change I make is to reduce the amount of salt pork to 4 ounces, which I do not soak. I just slice it thin and let it cook with the rest of the ingredients. No additional salt is then necessary. You pretty much have to cook the sausage, onions and peppers ahead of time, so this is not a time-saving recipe. I would consider it more of a crowd pleaser to make for a buffet or family party. Uses dried Great Northern beans. Too bland and dry. Flavor of canola oil comes through. Good shape. Rises well. I really don't like slow cooker recipes in which a lot of the cooking must be done before adding the ingredients to the slow cooker. It pretty much negates the value of the slow cooker. A useful recipe. Chicken can be shredded for tacos or sandwiches or frozen for later. Use water as the liquid and reuse in soups. There is an error in the ingredients list. This recipe calls for bone in chicken thighs, not breasts. Love the spice mixture for the jerk paste, although I would like to try with a scotch bonnet pepper instead of 3 jalapenos. Did not love the slow cooker method, I definately prefer these barbecued, or oven baked. Basic taco recipe based on the poached chicken, very similar to my standard recipe. This recipe has no mushrooms on the ingredients list, or even mentioned in the recipe. This is a nice slow cooker stew. The Guinness and the orange flavour from the orange peel compliment each other nicely. The sauce needs to be thickened at the end because it is very brothy and thin. All and all, a manly stew for a cold day. The meat eaters in my family loved this one. The pork was super tender. I used double the amount of beef broth & no wine, since none was on hand. Served it with Kluski noodles. This was very good. I'll definitely make it again. I browned the meat and the onions first. Added a little extra brown sugar. I only used one large onion. I used the optional garlic cloves but couldn't tell if it made any difference. If you're feeling extra ambitious, you might want to de-fat and reduce the cooking liquid. But it's tough to wait when you're hungry and it smells so good! Visited my grandma last week and her neighbor came over with a huge bag of apples from her backyard tree. Decided to turn them into apple butter the easy way in the slow cooker. Recipe states to let the apples macerate in the sugar or use a cup of apple juice or cider for liquid. I just used water. Also cut the sugar in half to start with. I decided to add additional after cooking, if needed, but the butter was perfect with the 1 cup. I also find that spices tend to lose their flavor if cooked for long periods of time so I added them after the lid is removed for thickening. This is a great recipe and will definitely make this again. Amazingly, 80 percent of American households own a slow cooker. For more than 30 years, its unbeatable convenience and practicality has made it a staple of families, enabling anyone to return to a home-cooked meal at the end of a hectic day. Many slow cooker recipes, however, have relied on less-than-healthy convenience products. 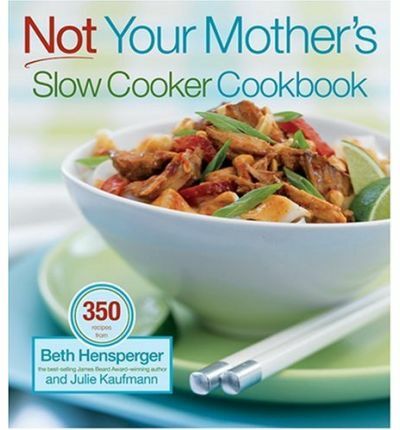 Now, Beth Hensperger and Julie Kaufman's Not Your Mother's Slow Cooker takes a completely fresh look at cooking with this popular appliance. This comprehensive collection of 350 recipes combines the ease of slow cooking with the fresh, wholesome ingredients and exciting flavors of today's kitchens. Beth Hensperger is the author of 14 previous cookbooks, including he James Beard Award Winner The Bread Bible. She currently writes for the San Jose Mercury News. Julie Kaufman is the deputy editor of the San Jose Mercury News and is co-author, with Beth Hensperger, of The Ultimate Rice Cooker Cookbooks.